We’d love your help. Let us know what’s wrong with this preview of Life Together by Dietrich Bonhoeffer. To ask other readers questions about Life Together, please sign up. How is this book? Intend to begin reading it as soon as I finish my current read. 1/11/09 I just reread this book for another class. I think it's my fourth reading now. All I want to add is that this book gets better each time. I'm amazed by Bonhoeffer's insight and the understanding of God that informs the whole work. It's small but packed with import. You'd think I would have learned its lessons in the first three readings, but I again found myself deeply challenged about my own behavior in Christian community. This one is worth coming back to again and again. 4/1/07 I 1/11/09 I just reread this book for another class. I think it's my fourth reading now. All I want to add is that this book gets better each time. I'm amazed by Bonhoeffer's insight and the understanding of God that informs the whole work. It's small but packed with import. You'd think I would have learned its lessons in the first three readings, but I again found myself deeply challenged about my own behavior in Christian community. This one is worth coming back to again and again. Whenever I read how-to books, I "skip to end" the consider the actual bio of the person. Does the person have a life narrative I admire? Would I actually want to be like them? If so, perhaps I'll take their advice. So here's Bonhoeffer. Nazi-resister, Gandhi liaison, secret super spy pastor. An amazing spirit, executed in a concentration camp, after laying a foundation for modern hearts to follow Christ. What a dude. I want to be like him, but maybe not in the exact manner he lays out here. This Whenever I read how-to books, I "skip to end" the consider the actual bio of the person. Does the person have a life narrative I admire? Would I actually want to be like them? If so, perhaps I'll take their advice. This book is essentially "German engineering for Christian communities." A theologically-rooted how-to manual for living life with other Christians, following a very precise order. What would happen if you applied principles of theology AND utter efficiency to living life together? This book. It is highly prescriptive and slightly antiquated, with many many "musts" and "shoulds." But in Bonhoeffer's words, "It's not legalism, it's fidelity and orderliness." The passages on doing the "day with others" and "the day alone" give me pause: the schedule seems indeed a product of the 30s-50s, Germany, from a male perspective; lots of time for Orderly Pursuit of Structured Things (reading scripture, singing hymns, praying together, etc. ), and it makes me evaluate my own chaotic household of boisterous kids, and I wonder where Bonhoeffer would find room for Playing Loudly With Preschoolers. I don't mean that dismissively: I think I could defend my schedule a little better against the chaos of the day in order to make time for meditation and solitude, and how I might invite my immediate family into more structured aspects of faith. Right now, Bonhoeffer's crew we ain't. The section on ministry is gorgeous. With its emphasis on listening, service, meekness, holding one's tongue, it calls people towards quite a powerful, quiet life of love. The passage on confessing was unexpectedly beautiful, and something I'll keep thinking about. SO convicting! If the church truly looked like this, the world would have no choice but to look and see what this was all about. My pastor said a few weeks ago in Sunday service that we come together not as a judge on "The Voice," deciding whether to turn around because we like the music or the person beside us or the sermon. For some reason that has stuck so closely with me for weeks now and has freed me tremendously. I think somewhere along the way I exchanged discernment (a good and necessary SO convicting! If the church truly looked like this, the world would have no choice but to look and see what this was all about. My pastor said a few weeks ago in Sunday service that we come together not as a judge on "The Voice," deciding whether to turn around because we like the music or the person beside us or the sermon. For some reason that has stuck so closely with me for weeks now and has freed me tremendously. I think somewhere along the way I exchanged discernment (a good and necessary thing) for judgment, constantly trying to discern if this music or if this method was following after God as closely as it ought to be. He reminded me that that's not my job. I'm not the head of the church and so while I don't accept just anything, the Holy Spirit is my filter. Life Together cemented so many of those things about my role in the body. I might need to reread this each time I've become part of a new fellowship. Because this book is so practically helpful, it would look different in every community. Because of my husband's job in the Navy, we move around a good bit and it was so fun to look at Life Together through the lens of every church we've been a part of and see the strengths of each congregation. This would also be an excellent read for any head of a body - whether that's a small family unit of marriage and family, a pastor, a Sunday school teacher, the head of a ministry team. I rarely give five stars to anything, but this book definitely deserves it. An excellent look at Christian community and the Christian life, this is full of thoughts that everyone who follows the Way needs to hear. Mr. Bonhoeffer may be long gone from this world, but his words still impact lives; they sure did mine! In my book club, we finished reading Life Together by Dietrich Bonhoeffer. It is a fantastic book that I will probably return to and read again (hopefully each year). It is a short read, my version has 147 pages, but it is filled with wisdom and biblical truth's. The book is about living life together in Christian community. The chapters breakdown the different aspects of life together. The book starts with an introduction that gives a background on Bonhoeffer and his life. He was born in 1906 an In my book club, we finished reading Life Together by Dietrich Bonhoeffer. It is a fantastic book that I will probably return to and read again (hopefully each year). It is a short read, my version has 147 pages, but it is filled with wisdom and biblical truth's. The book is about living life together in Christian community. The chapters breakdown the different aspects of life together. The book starts with an introduction that gives a background on Bonhoeffer and his life. He was born in 1906 and was martyred at the hands of the Gestapo in 1945. It is amazing, to me, to know that he wrote this book while living in a concentration camp, yet he writes with a peace that can only come from God. Chapter 1: Community - talks about the importance of the Christian community and how it is not only an essential but a tremendous blessing to our lives. He explores how we should serve one another as Christ served the church and how it is only because of Christ's love that we can love our neighbor. Chapter 2: The Day with Others - this chapter lays out, almost hour by hour, what a typical day could/should look like in a Christian community. He talks about prayer life in the morning and evening. He also address the importance of reading Scripture on a daily basis. He doesn't forget the fact that people have to work too. He says we all need to work and do the job God has set before us. I love this part, he says "Without the burden and labor of the day, prayer is not prayer, and without prayer work is not work." It's like prayer gets us through the work day and work makes our prayer life significant. Chapter 3: The Day Alone - this chapter addresses silence and solitude. Bonhoeffer explains how even when we live in community, we still need times of solitude, prayer, silence, meditation and intercession. He hits on this but at the end of the chapter he again reminds us that we are apart of the body and that after a time alone, we should again be joined in community. Chapter 4: Ministry - this chapter is about the ministry of serving each other. I learned a lot in the chapter as he talks about the ministry of holding one's tongue, the ministry of meekness, of listening, of helpfulness, of bearing, of proclaiming and of authority. He address these in the context of sharing our lives with each other. Chapter 5: Confession and Communion - this chapter is just what the title explains, confessing to one another and then celebrating communion. Technically, my third time reading this book. First time solo; second with wife; third with community group. Friends, I cannot overstate how good this book is. My marginal notes exponentially increase with every read. If you haven't read this classic on Christian community, please read it this year. I can think of few other books that will be a help in marriage, humble you in relationships, increase your love for the church and your appreciation of the grace of community like Bonhoeffer's short, but epic, reflection. So, so good. Read 2012: Most likely this will be my favorite book of 2012. So rich. the Word of God, the gospel, grounds community and creates it. The gospel takes us out of ourselves and points us to the other in Jesus Christ. How to do, lead, participate, and enjoy family/community worship in the AM and PM. It should consist of reading, singing, praying. The importance of silence and solitude, as well as private meditation. Official word ministry most important. However, we all have ministry of holding our tongue, meekness, listening, helping, bearing, and proclaiming to and for the other. Ministry of authority comes through service. The importance and benefit of private confession of sin, especially before Lord's Supper. 1. There is value in disillusionment with fellow Christians so to avoid seeing fellowship as an "extraordinary social experience." 2. "God has willed that we should seek and find His living Word in the witness of a brother, in the mouth of a man." 3. "The Psalter is the vicarious prayer of Christ for His church...the new Humanity of Christ, the Body continues to pray His prayer...that is why the prayer of the Psalms belongs...to the fellowship." 4. "Only in the infiniteness of [Scripture's] inner r 1. There is value in disillusionment with fellow Christians so to avoid seeing fellowship as an "extraordinary social experience." 4. "Only in the infiniteness of [Scripture's] inner relationships, in the connection of Old and New Testaments...will the full witness to Jesus Christ the Lord be perceived." What an amazing little book. I believe every Christian should read this at least once if not every year. It is definitely a must read. "A Christian fellowship lives and exists by the intercession of its members for one another, or it collapses. I can no longer condemn or hate a brother for whom I pray, no matter how much trouble he causes me. His face, that hitherto may have been strange and intolerable to me, is transformed in intercession into the countenance of a brother for whom Christ died, What an amazing little book. I believe every Christian should read this at least once if not every year. It is definitely a must read. A bold and penetrating book challenging Christians to the life of community, which is to say, a life of Cross-centred living. "It is easily forgotten that the fellowship of Christian brethren is a gift of grace, a gift of the Kingdom of God that any day may be taken from us..."
Ch.2 - The Day with Others. Ch.3 - The Day Alone. Ch.5 – Confession and Communion. Really, really good stuff here. At times it was a little over my head and I wished he'd had some more specific instructions regarding some issues and situations, and at other times I was like, whoa, way too specific! But for the most part, it was just solid theology about how Christians should be living with and supporting each other. Life Together is a short work by Dietrich Bonhoeffer sharing his thoughts on how Christians should function as a community. As a former Christian, I am not the target audience, but I was interested in hearing some of Bonhoeffer's writings more directly (though still in translation from the orginal German) after reading a biography of his life (review here). 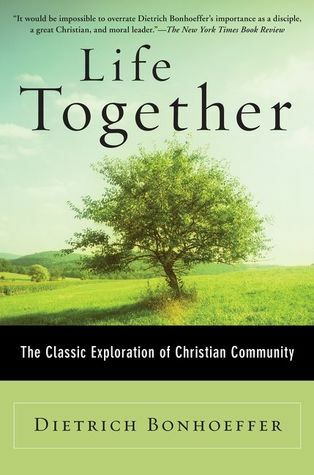 Life Together was published in 1939, right as World War II was getting started and Bonhoeffer had already begun speaking out against the Thi Life Together is a short work by Dietrich Bonhoeffer sharing his thoughts on how Christians should function as a community. As a former Christian, I am not the target audience, but I was interested in hearing some of Bonhoeffer's writings more directly (though still in translation from the orginal German) after reading a biography of his life (review here). Life Together was published in 1939, right as World War II was getting started and Bonhoeffer had already begun speaking out against the Third Reich. The context of Bonhoeffer's life is interesting, and summarized at the beginning of this edition, but mostly irrelevant to the content of the book itself. Bonhoeffer starts by reassuring his readers that it's okay when they find themselves in a hostile environment - in fact, that's the best way to be a Christian! Of course, if you live in an accepting climate, that's great, too: just be thankful if that's the case. He then talks about how all aspects of Christian life should exist in relation to Jesus Christ himself - all judging, mediating, direction giving, discipline and so forth should come from Christ. That would be great, of course: if only Jesus existed and was noticeably active in church life. Since He's not [this being my commentary, of course], Bonhoeffer has to work backwards from reality and offer general guidelines that have no real basis other than his own opinion, and have no teeth because they are enforced by... Jesus. At the same time, he criticizes anyone who would try to impose his own vision for what the church should be. Again, this makes it really hard to know where to turn for specifics when things go wrong, as they inevitably do. There are no guidelines for dealing with substantive issues. I kept wondering how Bonhoeffer would handle a clergy member who had abused children - I get the impression that he would pray, "lovingly" and "gently" rebuke the offender, and then hope Jesus would make everything right. In all things, God is given credit when things go right, and not to be blamed when things go wrong. He states this with remarkable clarity: "We do not complain of what God does not give us; we rather thank God for what He does give us daily." We next learn that Christians are to be thankful in all circumstances, especially pastors: they shouldn't gripe about their congregants' peccadilloes. You can sense here (and throughout) Bonhoeffer airing his own particular annoyances, and voicing his preferences as authoritative, scripture-induced directives. One of my favorite examples of this was when he chastised people who sang too low, or too loud, or too ostentatiously, for drawing attention to themselves and abusing their "privilege" to sing with the church body. He clearly had strong thoughts on singing, and I can just picture him glancing about peevishly during hymns. He next ventures into the Christian's daily life, even recommending specific times of the day to pray, and how to pray, when to meditate, and how to use the Psalms as a template in prayer. In the same way, he gives directives on what one should or shouldn't do while leading public prayers, or reading scripture aloud. Again, this reads as Bonhoeffer giving his own opinions the force of scripture. He doesn't directly say this, but his writing doesn't make a distinction between personal preference and Biblical authority, so it's hard to tell which is which. There are lots of Bible verses quoted throughout (plus a fair amount of Martin Luther). I thought it funny that Bonhoeffer speaks against taking verses out of context ("Holy Scripture does not consist of individual passages; it is a unit and intended to be used as such"), yet sprinkles single-verse quotes and references throughout the book. One cannot help but wonder why the Bible needs so much of Bonhoeffer's expounding and exegesis - presumably the original authors could have spent more time talking about Church community explicitly, and less about animal sacrifice. In one section he talks about the importance of being comfortable alone, by one's self, but also comfortable in community. That's all fine, but he takes it rather far: "If you refuse to be alone you are rejecting Christ's call to you, and you can have no part in the community of those who are called." Really? So what are you going to do, Bonhoeffer... find someone who can't be alone and kick them out of the church? I'm never sure how he plans to back up these tough-sounding declarations. Bonhoeffer is prone to strong categorical statements that declare, by fiat, that Christian spirituality is great and everything outside of it is base and horrible. For example: "The basis of all spirituality is the clear, manifest Word of God in Jesus Christ. The basis of all human reality is the dark, turbid urges and desires of the human mind." This is nonsense, and these kinds of statements irritated me in what was otherwise a fairly harmless book. So many wonderful gems in this book. Love this book so much! This is an excellent book about what it means to live in Biblical community. There is an abundance of wisdom in this work that can be applied in any context of community. At the same time, there is also an abundance of dogmatic prescriptions of how to go about every aspect of devotional life, at a level that is obviously excessive. It is important to read with discernment, and when recommending the book to others, to be wise in the maturity of the one to whom you recommend it. This is one of the most encouraging, eye-opening books I have read during my christian walk. It was such an encouragement and very convicting, especially the Ministry chapter. A must read for every christian! I zipped through this & am now rereading each morning as part of my devotions. A remarkable journey through life in the community, its necessity, and its supreme need for the individual. I will re-read this book next year. Born in 1906, Dietrich Bonhoeffer was a German pastor and theologian who opposed the rise of Hitler and his Nazi government when the majority of church leaders voted to support the new regime. At age 27 Bonhoeffer fled Germany and became the pastor of two German speaking churches in London, England. Two years later in 1935 he returned to Nazi controlled Germany to help established an underground, illegal seminary for pastors. Bonhoeffer also got caught up in the shifting political winds of the c Born in 1906, Dietrich Bonhoeffer was a German pastor and theologian who opposed the rise of Hitler and his Nazi government when the majority of church leaders voted to support the new regime. At age 27 Bonhoeffer fled Germany and became the pastor of two German speaking churches in London, England. Two years later in 1935 he returned to Nazi controlled Germany to help established an underground, illegal seminary for pastors. Bonhoeffer also got caught up in the shifting political winds of the country and ongoing war, becoming a spy for the Allied forces against Hitler and the Nazi. In the spring of 1943, eight years after returning to Germany, Bonhoeffer was arrested and placed in prison where he was died at 39-years of age on April 9, 1945. His book “Life Together” was originally published in 1938 and was rooted in the experience of living with his students and running the underground seminary. The book focuses on five key elements of the life together following Jesus: being in community with others, daily worship and devotions with others, personal spiritually, walking our calling with God, and confessing sins and living in forgiveness. Each one of these elements takes up an entire chapter wherein Bonhoeffer unpacks them in a matter that reflects someone who has lived the words on the page and not merely thought about them. In this way, the pages of “Life Together”, while not long, are incredible valuable to the greater Christian world, calling the followers of Jesus to live life together rather than as independent rafts adrift at sea. The first element of life together that Bonhoeffer tackles is quite simply community; that is, walking out life together as a people of Jesus. All too often people, especially in the United States of America or any other country with a long heritage of Christianity, take for granted the “privilege of living among other Christians” (pg 17). Bonhoeffer rightly points out that Jesus himself lived among his enemies and called his followers to do the same. Christians do not belong to the “seclusion of a cloistered life but in the thick of foes” (pg 17) so that the message of Gospel of the Kingdom of God may shine forth and souls may be deviled from the bonds of evil. From there, Bonhoeffer then moves on to describe what it means to start off the day within a community. Each day, Bonhoeffer suggests, should start with a common devotion shared by all members of the community during which the word of Scripture is read, the hymns of the Church are sung and the prayer of the fellowship prayed (pg 44). Each item in this list is of the upmost importance as they feed off each other and prepare the community for living life together amid their enemies. The third element of life together that Bonhoeffer expounds upon is personal spiritually. As valuable as the community can be for the individual, it can also be damaging as the individual ceases to find time to be alone with God. To counteract this, Bonhoeffer encourages each member of the community to set aside a portion of their day to sit in silence with Jesus in meditate on the Scriptures, prayer and intercession (pg 81). Afterwards, the individual is to come back into the greater community, bringing with them the “blessing of his aloneness” while, at the same time, receiving “anew the blessing of the fellowship” (pg 89). Walking out our calling with God through ministry is the fourth element that Bonhoeffer tackles. Only instead of talking about ministry in the typical manner of reaching outside of the community, Bonhoeffer talks about ministry to each other. It is the ministries of holding one’s tongue, meekness, listening, helpfulness, bearing, proclaiming, and authority that hold Bonhoeffer’s attention. The focus behind each of these ministries is to tackle the primary threat to the Christian community, which is the discord caused by community members trying to determine who is the greatest among them (pg 90). The fifth and final element of life together deals with confessing sins and living in forgiveness. A pious fellowship will, as Bonhoeffer noted, “permit no one to be a sinner” (pg 110). Therefore, seeing how each believer came to relationship with God through grace, it is of upmost importance that each follower of Jesus breaks the power of sin through confession. This confession does not have to be in front of the entire community; rather it can be done in fellowship with a trust brother or sister. It is enough that the sin is brought out “into the light” (pg 112). Bonhoeffer ends the books with some brief but powerful comments on the sacrament of communion. Specifically he calls out the need for each brother or sister to seek out “forgiveness of the others for the wrongs committed” (pg 121) before partaking the Lord’s Supper. “All anger, strife, envy, evil gossip, and unbrotherly conduct” (pg 121) is to be settled and removed from the community before receiving the grace of God through the sacrament. When this happens, all the members of the congregation become “united in body and blood at the table of the Lord” (pg 122). In conclusion, Dietrich Bonhoeffer’s book “Life Together” is a siren call to all Jesus followers to move beyond surface relationships and really live together under the grace of God. Believers are to embrace the community of other believers, worshiping daily with each other while respecting the need for individual communion with God as well as corporate worship. Furthermore, Bonhoeffer calls people forward to the ministry of serving others while living a life of forgiveness and confession. It is a tough call made all the more sharp by the knowledge that if Bonhoeffer and his students could live this way in the middle of Nazi Germany, then those in more peaceful times should be able to rise to the challenge. Small but mighty book full of riches for the Christian. Glad I finally read it. This short book has only an introduction and five chapters, but oh how profound are the thoughts contained therein. I have only just finished through the first chapter (Community) and found numerous passages to quote. Many of the reviews on this book quote copiously from the text, but I will still add to the din. I will be reading this again periodically as I try to internalize these ideas. "So between the death of Christ and the Last Day it is only by a gracious anticipation of the last things that Christians are privileged to live in visible fellowship with other Christians. It is by the grace of God that a congregation is permitted to gather visibly in this world to share God's Word and sacrament. Not all Christians receive this blessing. The imprisoned, the sick, the scattered lonely, the proclaimers of the Gospel in heathen lands stand alone. They know that visible fellowship is a blessing. They remember, as the Psalmist did, how they went "with the multitude...to the house of God, with the voice of joy and praise, with a multitude that kept holyday" (Ps.42:4). But they remain alone in far countries, a scattered seed according to God's will." "But God has put this Word into the mouth of men in order that it may be communicated to other men. When one person is struck by the Word, he speaks it to others. God has willed that we should seek and find His living Word in the witness of a brother, in the mouth of man. Therefore, the Christian needs another Christian who speaks God's Word to him. He needs him again and again when he becomes uncertain and discouraged, for by himself he cannot help himself without belying the truth. He needs his brother solely because of Jesus Christ. The Christ in his own heart is weaker than the Christ in the word of his brother; his own heart is uncertain, his brother's is sure. And that also clarifies the goal of all Christian community: they meet one another as bringers of the message of salvation. As such, God permits them to meet together and gives them community. Their fellowship is founded solely upon Jesus Christ and this 'alien righteousness.' All we can say, therefore, is: the community of Christians springs solely from the Biblical and Reformation message of the justification of man through grace alone; this alone is the basis of the longing of Christians for one another." "When the way of intellectual or spiritual selection is taken the human element always insinuates itself and robs the fellowship of its spiritual power and effectiveness for the Church, drives it into sectarianism. The exclusion of the weak and insignificant, the seemingly useless people, from a Christian community may actually mean the exclusion of Christ; in the poor brother Christ is knocking at the door. We must, therefore, be very careful at this point." "We must learn to know the Scriptures again, as the Reformers and our fathers knew them. We must not grudge the time and the work that it takes. We must know the Scriptures first and foremost for the sake of our salvation. But besides this, there are ample reasons that make this requirement exceedingly urgent. How, for example, shall we ever attain certainty and confidence in our personal and church activity if we do not stand on solid Biblical ground? It is not our heart that determines our course, but God's Word. But who in this day has any proper understanding of the need for scripture proof? How often we hear innumerable arguments 'from life' and 'from experience' put forward as the basis for most crucial decisions, but the argument of Scripture is missing. And this authority would perhaps point in exactly the opposite direction. It is not surprising, of course, that the person who attempts to cast discredit upon their wisdom should be the one who himself does not seriously read, know, and study the Scriptures. But one who will not learn to handle the Bible for himself is not an evangelical Christian." Life Together, published in German in 1938, then translated into English in 1956, is Dietrich Bonhoeffer’s prescriptive for disciplined fruitful Christian life as it is lived in community, whether as the typical family unit or in a more communal setting. Bonhoeffer had been living and working in London as pastor of two congregations as he had chosen to leave Germany due to what, translator, John W. Doberstein explains was his conviction that German-Christian relations had been compromised in thei Life Together, published in German in 1938, then translated into English in 1956, is Dietrich Bonhoeffer’s prescriptive for disciplined fruitful Christian life as it is lived in community, whether as the typical family unit or in a more communal setting. Bonhoeffer had been living and working in London as pastor of two congregations as he had chosen to leave Germany due to what, translator, John W. Doberstein explains was his conviction that German-Christian relations had been compromised in their relationship with the Third Reich. However, the Confessing Church requested that he return to his homeland and lead an underground seminary to train young pastors. At great risk, Bonhoeffer returned, living in common with twenty-five vicars in Germany while equipping other ministers. While in this living and work situation, he continued to write and Life Together is one of the works that grew out of this experience. Bonhoeffer’s theology is decidedly Christocentric in nature, so for those of us who do not subscribe to this type of exegesis, the book may initially be off-putting, however, his thoughtful treatment of what it requires from each individual to live out Christian-based communal life in the healthiest possible manner is strong, consistent, biblical and compassionate. His devotion to G-d is found within every single line and so is his deep desire for others to experience it as well. Bonhoeffer was arrested in April of 1943 and placed in a military prison where he continued to minister. He was transferred to various prisons from October 1944 onward and on April 8, 1945 at the concentration camp of Flossenburg, shortly after teaching and praying with fellow prisoners, he was removed from his cell and was led to the gallows the following day. Not long after, the camp was liberated by allied forces. Bonhoeffer’s passionate recommendations regarding both daily life and the arc of a community’s obligations over time seem daunting even to me, a deeply committed believer, and I wonder if this is either because of Bonhoeffer’s own radical commitment to Christ which might very well supercede the experience of most or if this is due to my own relatively relaxed and informal Christian experience in American culture which, at the present time, doesn’t put a high premium on discipline. In any case, Life Together not only gives a firm outline for living a truly Christian daily life where G-d is at the center, but gives a coherent, loving rationale for even the strictest discipline. I highly recommend this book, for if even a few of his recommendations were to be put into practice, one could not help but experience a profoundly changed and deepened relational experience with G-d and others. "Life Together" might be Bonhoeffer's most practical book; theology with its work clothes on. He was addressing Christian community. It surprised me that he addressed some sections specifically to Christian families, although it shouldn't have. After all, that is a form of community most Christians will be involved in for at least a portion of their lives. He is quite specific in suggesting how families should live, not only saying that they should sing but what they should sing (first Reformati "Life Together" might be Bonhoeffer's most practical book; theology with its work clothes on. He was addressing Christian community. It surprised me that he addressed some sections specifically to Christian families, although it shouldn't have. After all, that is a form of community most Christians will be involved in for at least a portion of their lives. He is quite specific in suggesting how families should live, not only saying that they should sing but what they should sing (first Reformation chorales, then hymns of the Bohemian Brethren, then hymns of the ancient church). There is the bass or the alto who must call everybody's attention to his astonishing range and therefore sings every hymn an octave lower. There is the solo voice that goes swaggering, swelling, blaring and tremulant from a full chest and drowns out everything else to the glory of its own fine organ. Oh, dear. What would Bonhoeffer think of the music in the church I go to? We might dismiss some of Bonhoeffer's observations on singing, but there is much content in this short book that we won't so easily evade. I find myself especially wrestling with his thoughts on confessing our sins to our brothers. Bonhoeffer also employed a phrase that is commonly used today (particularly in letters to the editor): He loves the sinner but He hates sin. I wonder if Bonhoeffer coined that phrase? Bonhoeffer reminds me of C.S. Lewis in that there are things I wish he had said, but didn't and at times things I wish he hadn't said, but did. However, there is so much wisdom, so many paragraphs that bring us back to the essentials of Christian community, such a great understanding of human nature and sin, that Life Together was well worth the read. Several parts greatly impressed me. First, his discussion of Christian community as a grace and work of Christ was excellent. Second, his section o Bonhoeffer reminds me of C.S. Lewis in that there are things I wish he had said, but didn't and at times things I wish he hadn't said, but did. However, there is so much wisdom, so many paragraphs that bring us back to the essentials of Christian community, such a great understanding of human nature and sin, that Life Together was well worth the read. Second, his section on common prayer/worship changed the way I did my family worship and gave numerous reasons on why the Psalms are central to all worship. Third, his focus on listening before proclaiming was a good reminder for those of us proclaim for a our vocation. But it is a good reminder for all Christians. We cannot truly bring the word to people if we do not listen to them. Our applications will fall short. A little book that should be read slowly. Not all that Bonhoeffer says could be universally applied to every form of Christian community. But he is thoughtful and certain things he says makes you aware that he has walked with Christ in community into deep waters. This review has been hidden because it contains spoilers. To view it, click here. Bonhoeffer on the Christian community: “We have one another only through Christ, but through Christ we do have one another, wholly, and for all eternity. That dismisses once and for all every clamorous desire for something more. One who wants more than what Christ has established does not want Christian brotherhood. He is looking for some extraordinary social experience which he has not found elsewhere; he is bringing muddled and impure desires into Christian brotherhood. Just at this point Chri Bonhoeffer on the Christian community: “We have one another only through Christ, but through Christ we do have one another, wholly, and for all eternity. “Innumerable times a whole Christian community has broken down because it had sprung from a wish dream. The serious Christian, set down for the first time in a Christian community, is likely to bring with him a very definite idea of what Christian life together should be and to try to realize it. But God’s grace speedily shatters such dreams. Just as surely as God desires to lead us to a knowledge of genuine Christian fellowship, so surely must we be overwhelmed by a great disillusionment with others, with Christians in general, and, if we are fortunate, with ourselves. By sheer grace, God will not permit us to live even for a brief period in a dream world. He does not abandon us to those rapturous experiences and lofty moods that come over us like a dream. God is not a God of the emotions but the God of truth. Only that fellowship which faces such disillusionment, with all its unhappy and ugly aspects, begins to be what it should be in God’s sight, begins to grasp in faith the promise that is given to it. The sooner this shock of disillusionment comes to an individual and to a community the better for both. A community which cannot bear and cannot survive such a crisis, which insists upon keeping its illusion when it should be shattered, permanently loses in that moment the promise of Christian community. Sooner or later it will collapse. Every human wish dream that is injected into the Christian community is a hindrance to genuine community and must be banished if genuine community is to survive. He who loves his dream of a community more than the Christian community its4elf becomes a destroyer of the latter, even though his personal intentions may be ever so honest and earnest and sacrificial. Because God has already laid the only foundation of our fellowship, because God has bound us together in one body with other Christians in Jesus Christ, long before we entered into common life with them, we enter into that common life not as demanders but as thankful recipients. We thank God for what He has done for us. We thank God for giving us brethren who live by His call, by His forgiveness, and His promise. We do not complain of what God does not give us; we rather thank God for what He does give us daily. And is not what has been given us enough: brothers, who will go on living with us through sin and need under the blessing of His grace? Is the divine gift of Christian fellowship anything less than this, any day, even the most difficult and distressing day? Even when sin and misunderstanding burden the communal life, is not the sinning brother still a brother, with whom I, too, stand under the Word of Christ? Will not his sin be a constant occasion for me to give thanks that both of us may live in the forgiving love of God in Jesus Christ? *** On our daily meditation with God, Bonhoeffer distinguishes 3 parts: 1. meditating repeatedly on a single piece of scripture to discern personal meaning, 2. Prayer, which he mentions praying about the objects that come to mind when your mind wanders (incorporating those thoughts into prayer), and 3. Intercession, praying specifically for those around you, repeatedly day after day, and especially for those for whom you hold ill will or have disagreements with. I have never read a book that explains Christan fellowship so thoroughly. This will definitely be on my read again list.